With a provenance that dates back to the mid 1940s, Chestnut Lodge exudes the spirit of Mountain Lake Lodge. Recently updated throughout, this lodge was named in honor of the now extinct American Chestnut Trees that once blanketed the mountain. 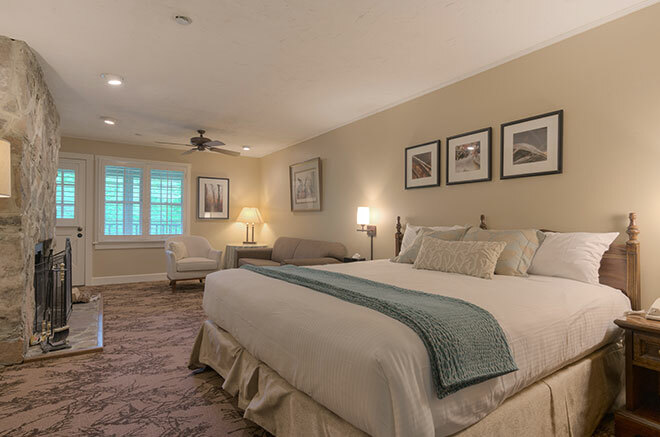 Choose from one of sixteen spacious accommodations that offer one king or two queen beds, a cozy living area featuring wood burning fireplace, comfortable sofa bed, cable television, hairdryer, iron and ironing board, microwave, mini refrigerator, complimentary wireless Internet, and local calls. Your own private balcony overlooking the lush forest invites you to step outside and breathe in the fresh mountain air. 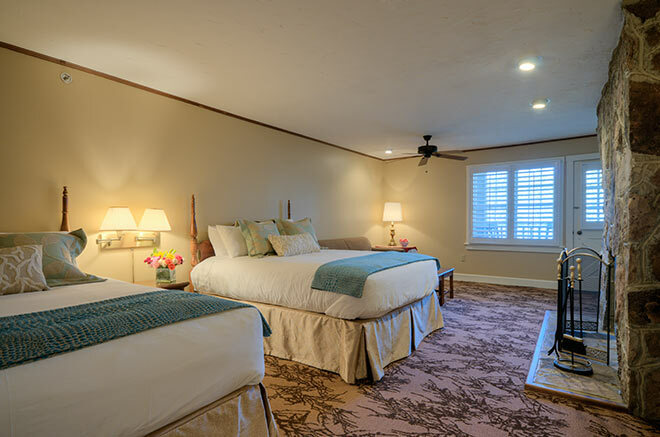 A truly relaxing place to call home for 4-6 guests. Please note that these rooms and suites feature exterior entrances and two-story staircases. There is no elevator in the Chestnut Lodge. Enjoy spacious accommodations that feature two comfortable queen size beds, giving couples or families enough room to spread out and enjoy. Free Wi-Fi keeps you connected and a private balcony beckons you to enjoy the mountain air. The perfect retreat for a romantic getaway, enjoy the crackle from your wood-burning fireplace as you lounge in a spacious king size bed. A cozy living area and private balcony deliver space to relax and enjoy the surroundings and each other.